Do you know an exceptional massage educator? 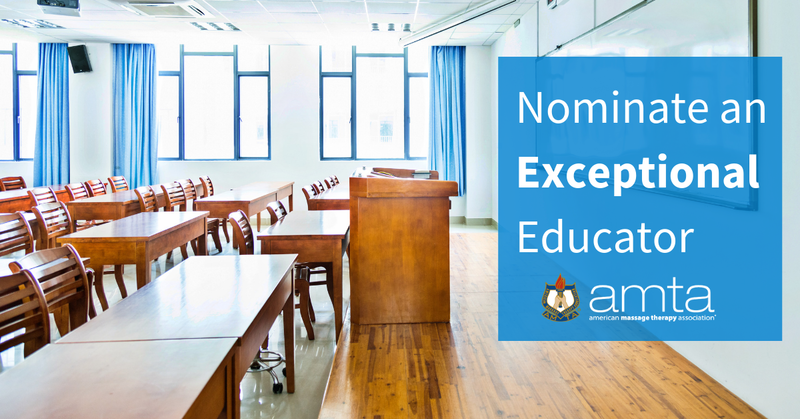 Now is the time to nominate an educator and leader, who is inspiring others to change the world, one massage at a time. AMTA is currently accepting 2019 nominations for the Jerome Perlinkski Teacher of the Year and the Dianne Polseno Lifetime Achievement Awards through April 30, 2019.
Who Inspires You? This award honors the memory of Jerome Perlinski, an extraordinary educator and much loved leader. Jerome Perlinski is remembered for his recognition of the gifts and talents of others and his ability to bring out their best. A consumer and advocate of massage therapy who was not a practitioner, Jerome held a doctorate in the history of ideas from St. Louis University. He was a widely experienced teacher and lecturer whose committed work helped raise training standards, improve teaching methods and educate massage practitioners about the importance of ethical, professional behaviors. When colleagues remember Jerome, they use words like inspired, passionate, motivating, principled and exceptional. Nominations for the 2019 Jerome Perlinski Award are now open. Nominations are due April 30, 2019. The Dianne Polseno Lifetime Achievement Award honors the memory of Dianne Polseno, an industry leader who left behind a legacy of integrity, professionalism, leadership, volunteer service, massage research and an unquestionable commitment to the advancement of the massage education profession. AMTA wants to honor a person who also manifests these qualities. Tell us whose lifetime of achievements should be recognized. The Lifetime Achievement nominee should have manifested a history of unquestionable leadership, volunteer service, professionalism, integrity and a commitment to research to advance the massage education profession. Nominees must have a minimum of 15 years of service to massage education. Nominations for the 2019 Dianne Polseno Award are now open. Nominations are due April 30, 2019.